Neurophysiology: There are two ways that nociceptive information reaches the central nervous system. 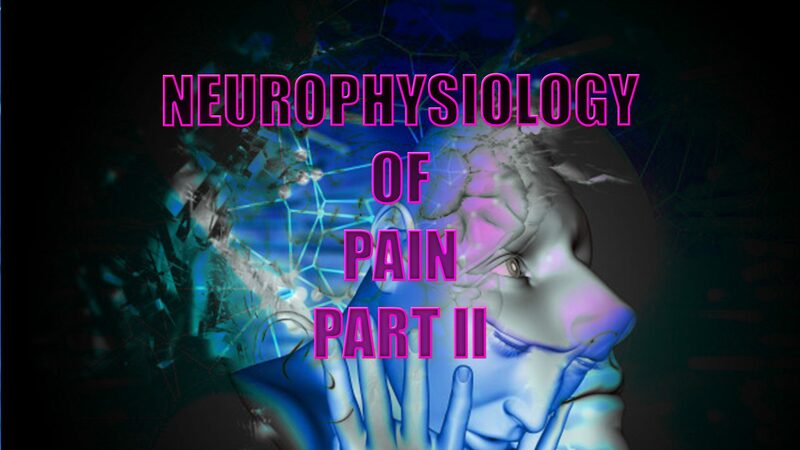 One is the neospinothalamic tract for quick pain and two is the paleospinothalamic tract for slow pain that increases. The trigeminal pathway brings information from the face area. The spinothalamic pathway brings information from the rest of the body. 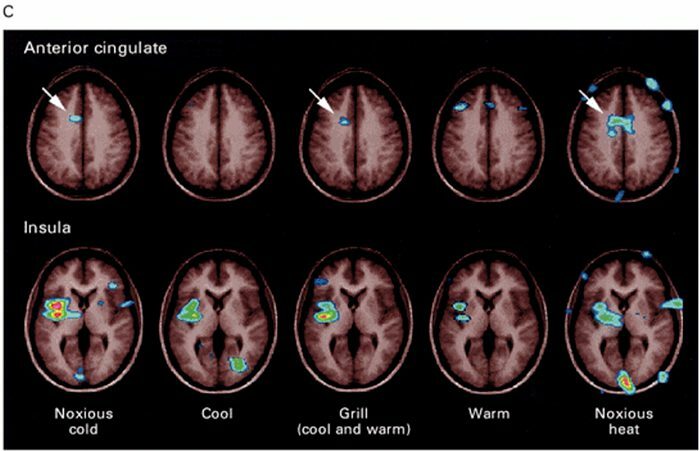 Both these pathways project to the sensory cortex, which also receives information on innocuous stimuli such as touch, pressure and warmth via a separate pathway. … in connection with an intense burning sensation following hand contact with the thermal grill. Adapted from Craig et al. 1994, 1996. 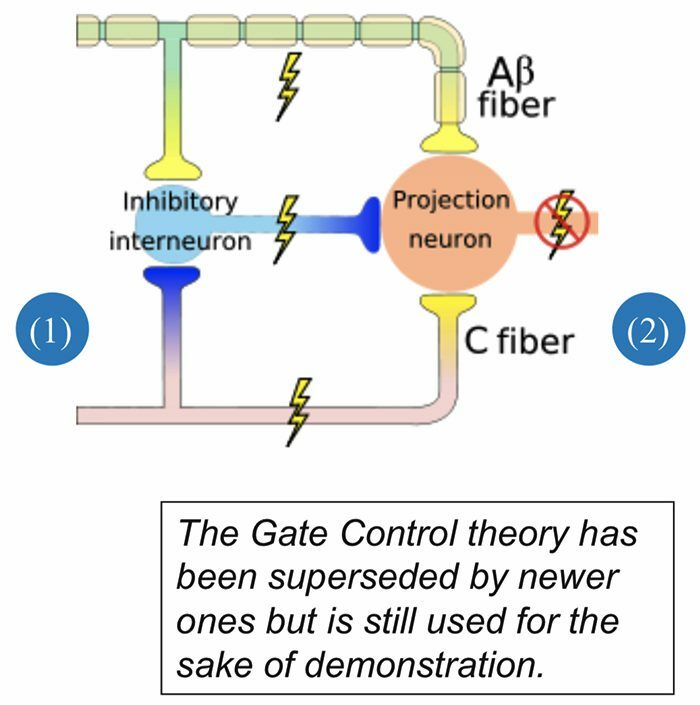 From Principles of Neural Science, Kandell et al. 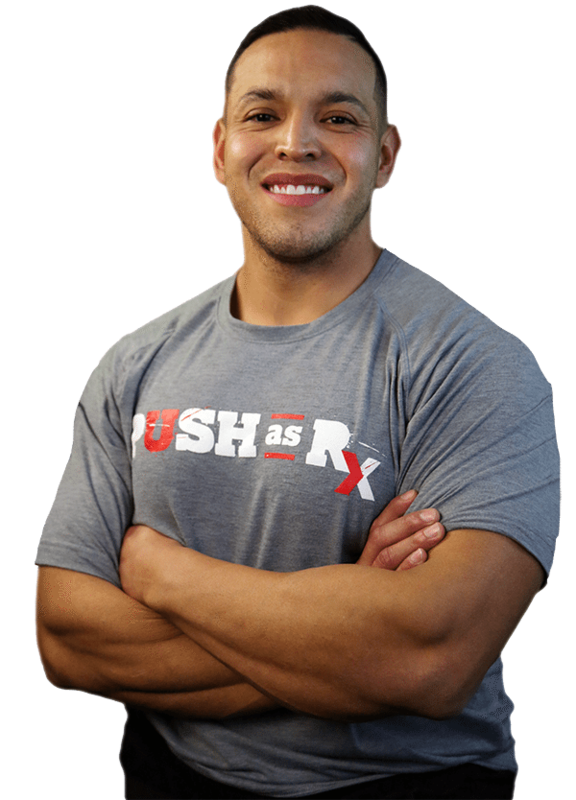 There is difference between the objective and subjective aspects of injury and pain. Despite similar injury, people can differ in how much pain they feel. Depending on the context, pain may not be felt despite injury, e.g. battlefield injury, during intense sports. This suggests that there is a physiological mechanism that controls the transmission of nociceptive signals to the brain or modifies the interpretation of pain. 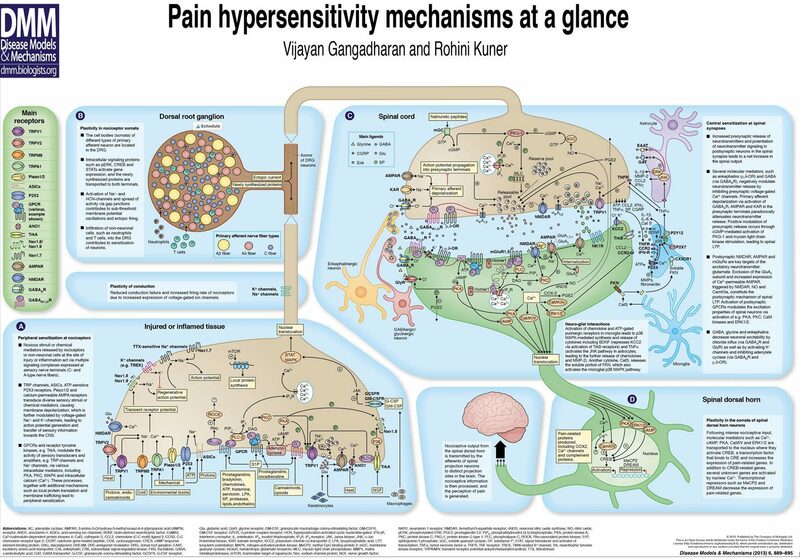 The pain control system can also explain the placebo effect. 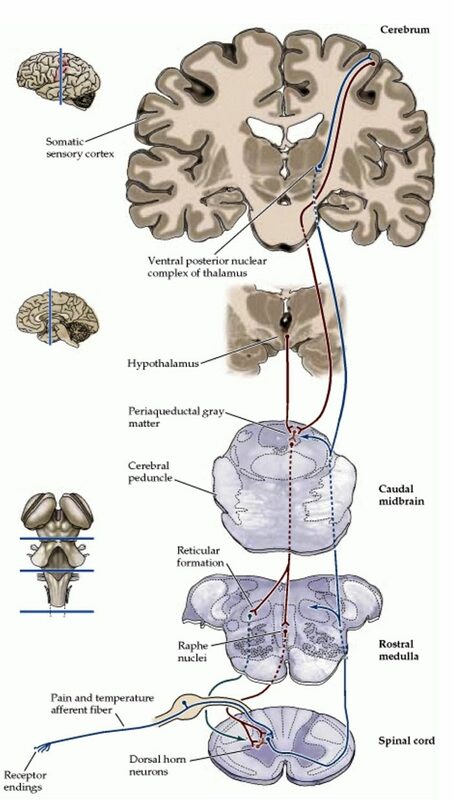 Nerve signals are sent form the somatic sensory cortex and hypothalamus to the periaqueductal gray matter (PAG). PAG sends signals to the parabrachial nucleus, medullary reticular formation, locus coeruleus, and Raphe neulei. These in turn can control the in the transmission of nociceptive signals from the spinal cord to the brain. This involves different involves different neurotransmitters. Internally produced molecules with opioid-like action which regulate transmission of nociceptive signals. Despite these being powerful, endogenous modifiers of nociceptive signals, it has been difficult to produce and administer them in a way than can used in clinical practice. 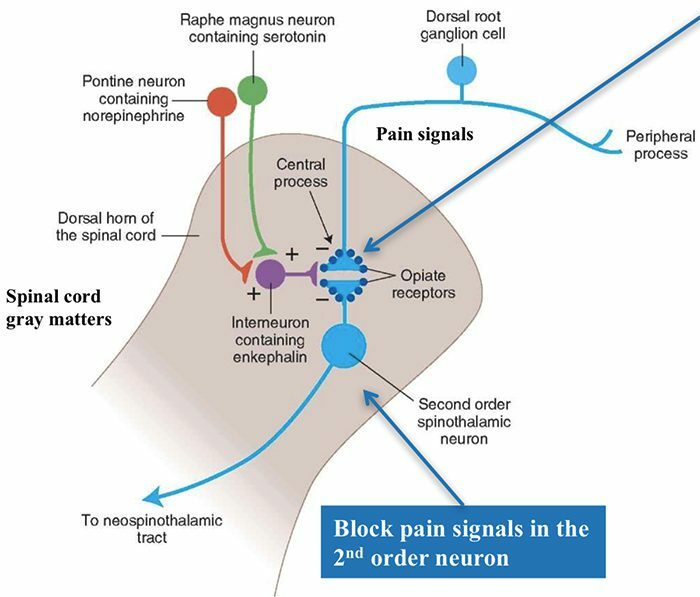 In the spinal cord, endogenous opioids can prevent transmission between 1st order nerve cells (bringing signals from the periphery) and 2nd order spinal nerve cells that transmit the signals to the brain. Also can prevent the increased synaptic efficiency, which plays a role in hyperalgesia. 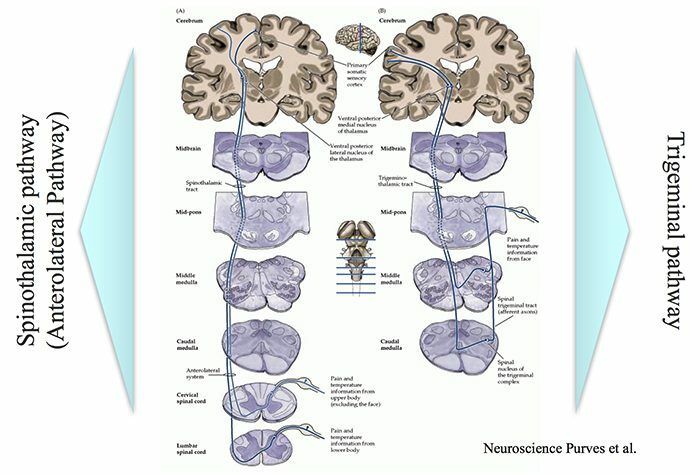 Connections in the spinal cord where opiates act. 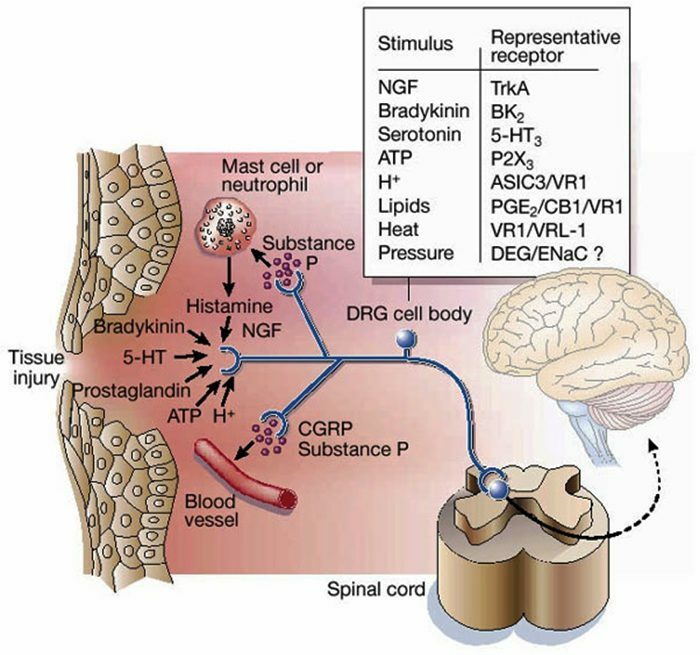 Neurotransmitters – serotonin (5- HT) and norephinephrine (noradrenaline) – in the spinal cord can block transmission of pain signals to the brain. Tissue damage results in the release of a number of chemicals. 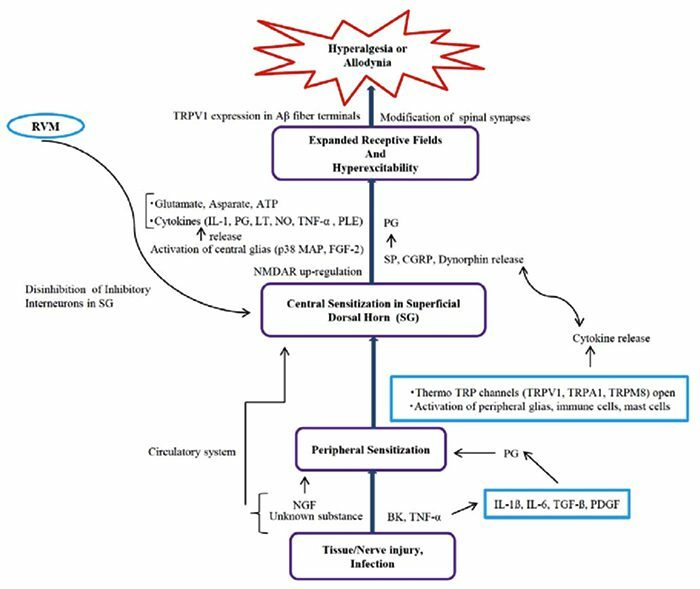 These increase nociceptors’ response to a stimulus (=hyperalgesia) & produce inflammation. Hyperalgesia = when the magnitude of the response to a nociceptive stimulus is higher than normal. 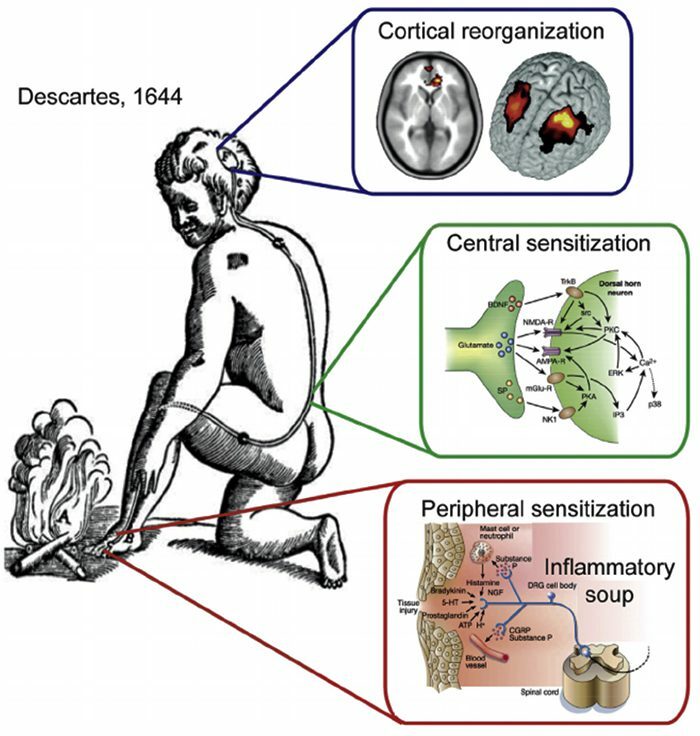 Knowing the molecules involved in the “inflammatory soup” and how they are synthesized provides possible targets for pain reduction. e.g. prostaglandins are produced by the COX enzyme. The activity of this enzyme is blocked by non-steroidal anti- inflammatory drugs (NSAIDs) such as ibuprofen, diclofenac. A condition when normally non- painful stimuli cause pain, e.g., touch, light pressure, cold. 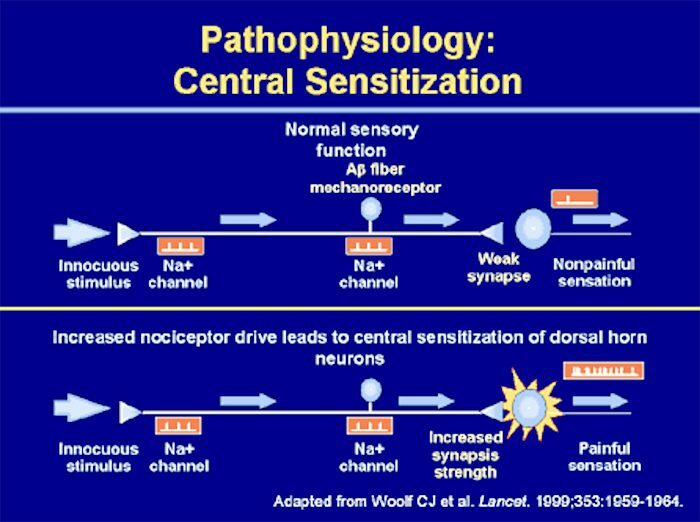 Involves changes in the synaptic sensitivity of the nociceptive neurons in the spinal cord (central sensitization). Drugs such as ketamine, block NMDA receptors and so reduce transmisison of the nociceptive stimuli. After stubbing a toe, we instinctively rub the area; this reduces the sensation of pain. Ronald Melzack and Patrick Wall in 1962 provided an possible explanation for this effect. Rubbing the area that hurts stimulates receptors of innocuous stimuli like touch, pressure and vibration. 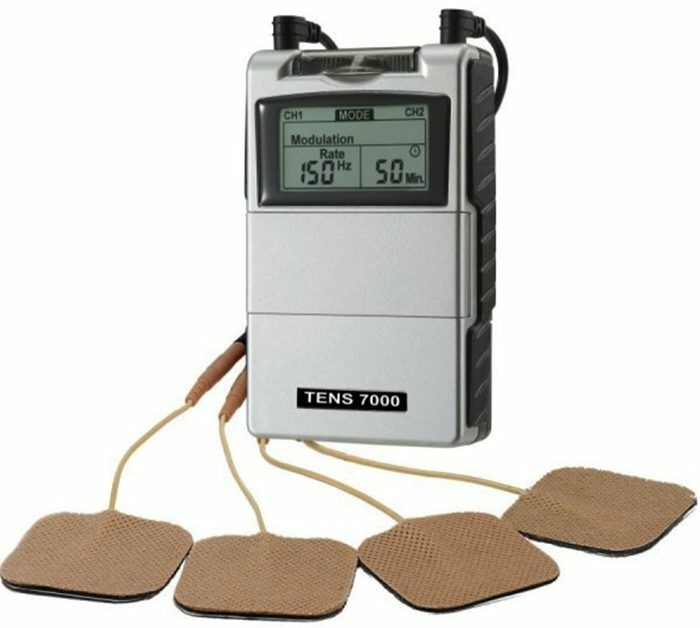 Transcutaneous Nerve Stimulation (TENS) is based on the Gate Control Theory. Nerves of the innocuous sensory system are stimulated and they in turn, inhibit transmission of nociceptive stimuli in the spinal cord. Patients with amputation often have burning or tingling pain in the body part removed. One possible cause is that nerve fibers at the stump are stimulated and the brain interprets the signals as originating in the amputated portion. 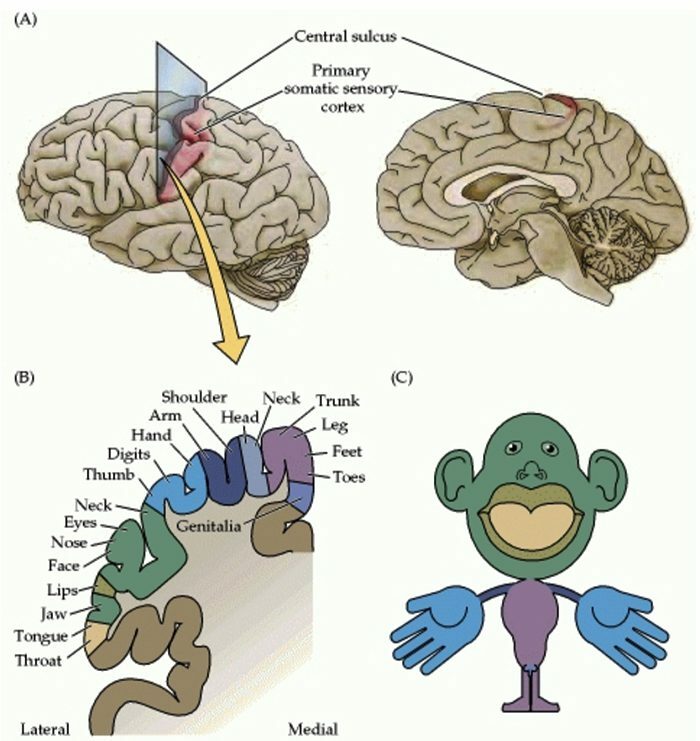 The other is the rearrangement within the cortical areas so that area say for the hand now responds to signals from other parts of the body but still interprets them as coming for the amputated hand. 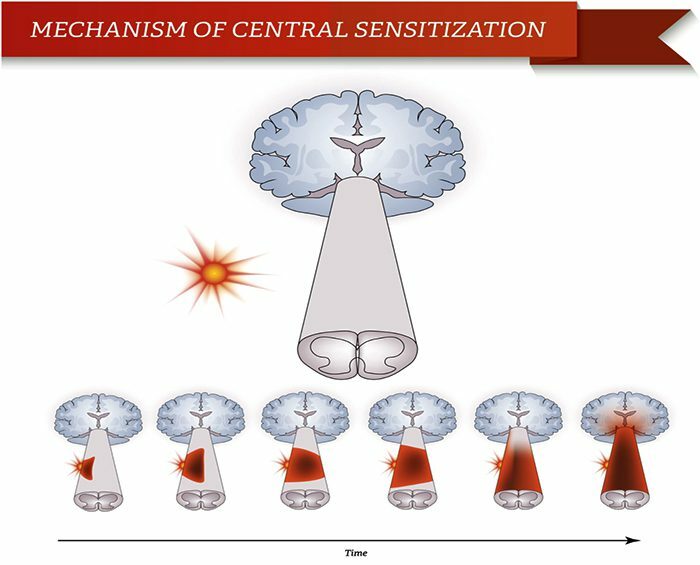 Peripheral sensitization represents a reduction in the threshold and/or an increase in magnitude of responsiveness at the peripheral ends of sensory nerve fibers. This occurs in response to chemical mediators released by nociceptors and non-neuronal cells (e.g. mast cells, basophils, platelets, macrophages, neutrophils, endothelial cells, keratinocytes and fibroblasts) at the site of tissue injury or inflammation. Basically, it is an increased sensitivity to an afferent nerve stimuli. A condition of the nervous sytem that is associated with the development and maintenance of chronic pain. Known as “wind-up” or persistent high reactivity. “Plastiticity in pain pathways” or the persistence of pain even after an injury has healed. Is this negative or positive plasticity? – Allodynia – occurs when a person experiences pain with things that are normally not painful, ie, soft touch causes pain. – Hyperalgesia – occurs when a stimulus that is typically painful is perceived as more painful that it should be, ie, a simple bump. Both are due to hyperreactivity of the nervous system. Often originates from a visceral organ. May be felt in a part of the body remote from the site of the pathology. The mechanisms may be spinal convergence of visceral and somatic afferent fibers on spinothalamic neurons. 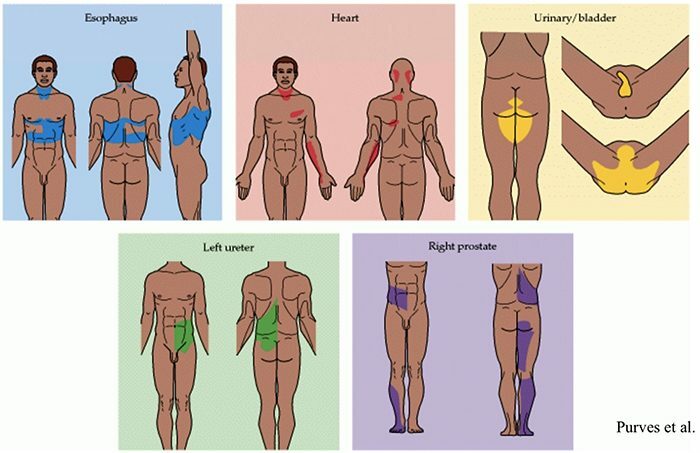 Common manifestations: cutaneous and deep hyperalgesia, tenderness, muscular contractions.